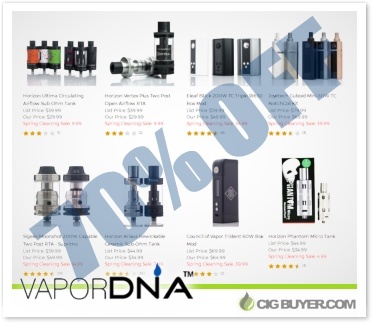 Updated Vapor DNA Clearance Section – Up To 70% OFF! It looks like Vapor DNA has updated their clearance section again – and they have some really great items at a hefty discount! You’ll find everything from starter kits and mods, to tanks and drippers – all reduced by up to 70% OFF. Some standouts include Digiflavor Espresso Tank just $14.99, iPV Vesta 200W just $34.99, Joyetech Ocular 150W just $41.99, Kanger Pangu Tank just $9.99, OBS Engine Nano RTA just $17.99, SMOK H-Priv Pro 220W just $32.99, Vaporesso Nebula 100W just $29.99, Wotofo Lush RDA just $14.99 and more.